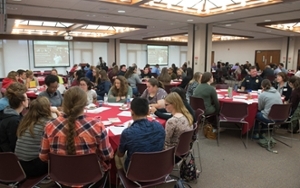 Conversations about race, building a more safe and equitable campus and the changing face of higher education were among the issues discussed Tuesday, Oct. 10 at Southern Illinois University Edwardsville’s “Race Dynamics and Racism on Today’s Campus” conference, hosted by the Office of Institutional Diversity and Inclusion. The goal of the session, according to conference host Venessa Brown, PhD, associate chancellor and chief diversity officer, was to do an institutional review in reference to the national climate, changing demographics in the country and across college campuses, and in light of recent racial incidents on the SIUE campus that go against the University’s values. Kenith Bergeron, of the Community Relations Service (CRS) program in the Midwest Regional Office of the U.S. Department of Justice, told the group that his office learned of the racial incidents at SIUE through media reports. Bergeron said when he contacted Brown’s office, he was glad to learn about the upcoming racism conference and was more than happy to be a speaker. 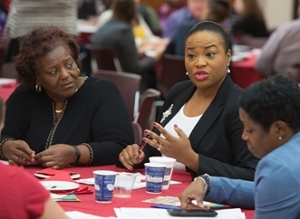 “The Changing Demographics in Higher Education,” as reported by Jerrica Ampadu, PhD, assistant professor in the SIUE School of Nursing and diversity and inclusion coordinator; and Megan Robb, MA, associate professor in the Department of Art and Design. Through the year 2022, student enrollment in higher education is expected to increase by 7 percent for white students, 26 percent for black students, 27 percent for Hispanic students and 7 percent for Asian/Pacific Islander students. There were small group discussions to rate where SIUE ranked on the Multicultural Organization Development (MCOD) scale, with stage one as being an exclusionary organization and stage six as being a multicultural organization. Terra Cole Brown, program advisor in the Office of Graduate and International Admissions, and Jessica Harris, PhD, associate professor in the Department of Historical Studies and director of Black Studies, facilitated the discussions. “I enjoyed the conference because we were able to have an open dialogue about racial tension on our campus, so we can find definitive outlets and solutions for improving the situation,” said Terrell Jones, graduate assistant in University Housing. Scott Baietti, community director in University Housing, was encouraged by the conversations. He said he would watch to see how the conference ideas and discussions would be implemented in the day-to-day life of the campus, especially in the SIUE Diversity and Inclusion Strategic Plan. L-R: Conference Host Venessa Brown, PhD, associate chancellor and chief diversity officer; Terra Cole Brown, program advisor in the Office of Graduate and International Admissions; and Jerrica Ampadu, PhD, assistant professor in the SIUE School of Nursing and diversity and inclusion coordinator. 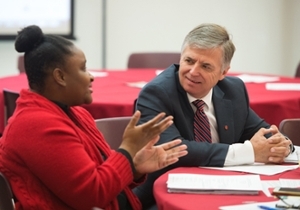 SIUE Chancellor Randy Pembrook listens to Kalisha Turner, academic advisor, during the “Race Dynamics and Racism on Today’s Campus” conference.